These photos were taken by Neil France while hanging from his paramotor flying machine or something similar. A much larger album of Neil's photos can be found at: www.flickr.com/photos/view_from_above/447479429/. Also see: emails on the subject. 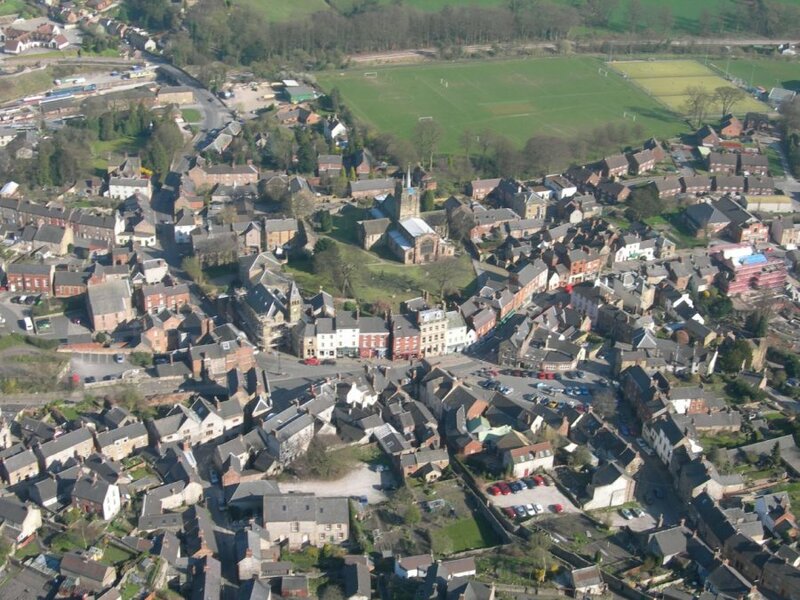 01 - Wirksworth town centre, looking South-East. Use the Interactive Map to see the buildings close-up. 02 - Alport heights (SK305-515). 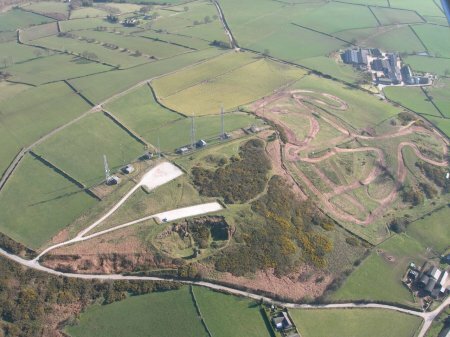 A thousand foot hill with a trig point, now graced by two big radio masts and a motorcross course. 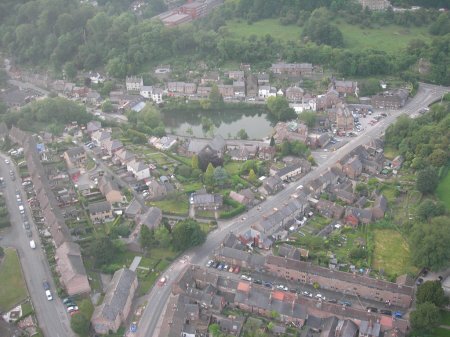 Bottom right is Spout village, 2 miles SE of Wirksworth. Top right is Coneygreave Farm. The area used to be called Ashleyhay. The gorsey area is National Trust. 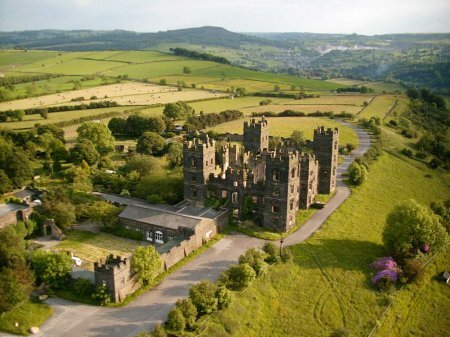 03 - Riber Castle (SK309-590), a fine view of the mock gothic ruin built about 1867 as a summer retreat by the famous John Smedley. Built on the summit of a steep hill, it is the most eyecatching sight on a visit to Matlock. The Hydro, built by the same man, is the next most eyecatching sight. More views and info on X166. 04 - Matlock Bath (SK295-584). The bridge over the River Derwent is Jubilee Bridge, and top-right is the Railway station. 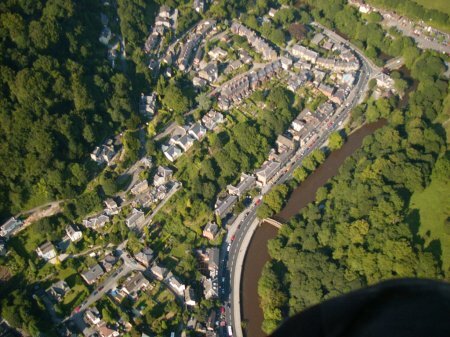 Across the river, Matlock Bath faces the highest inland vertical cliff in England. The A6 follows the river along the Dale. 05 - Bonsall Moor (SK245-600). Looking E along Bonsall Lane at the junction with Bonsallmoor Lane. The ridge looks down on Winster (left) and is pockmarked with old lead mine shafts, some said to be still open but all dangerous. 06 - Middleton Top engine House (SK277-552) on the old Cromford & High Peak Railway. Built in 1828, the CHPR once had 9 such stationary engines dragging trucks up 1 in 8 inclines. 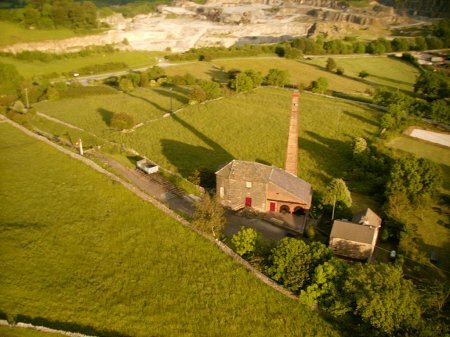 Middleton Top is now the only engine house still existing. The railway has been dismantled, and turned into a trailway for walkers and cyclists. 07 - Cromford Village (SK295-569). The village was rebuilt around 1780 by Sir Richard Arkwright to house workers in his new water-powered Cotton Spinning Mill, which introduced the factory system and changed the world. The Lake in the village centre is behind a dam which controlled the supply of water to the waterwheels driving the spinning machines in the factory. 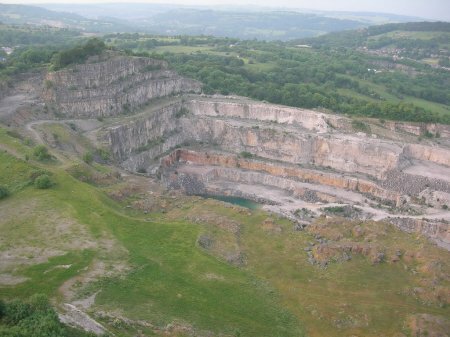 09 - Middle Peak Quarry (SK280-545), 66 acres on the NW edge of Wirksworth town. Mechanisation in the 1950's greatly increased production, heavy lorries passing through the town nearly ruined Wirksworth with vibration, dust and danger. Inactive for 12 years, quarrying threatens to start again in 2007. 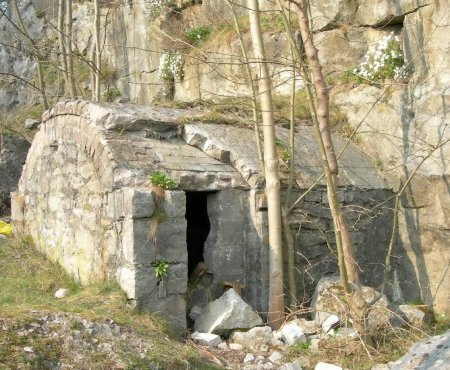 Limestone quarrying replaced lead mining around 1800 when the lead ran out after 2,000 years. 10 - Masson Mill (SK295-573) and River Derwent. Masson mill was the second built by Sir Richard Arkwright, about 1783. Arkwright also built himself a fine big house at Willersley, looking down onto the mill from the other side of the river. 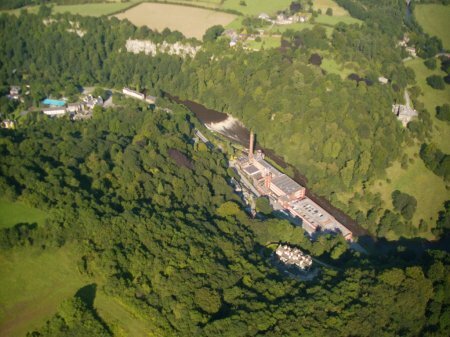 100 years later, Lawton the manager of Masson also built himself a fine house called Woodbank, looking down onto the Mill from the other side of the mill. When my wife and I first married we lived within the shadow of Middle Peak on Cavendish Cottages Cromford Road which we rented from my kinsman Joseph Flint who had been a Blacksmith / Engineer at Shaws Quarry . (Joe Grandson of Joseph Flint who played cricket for Derbyshire 1870s ) The field next door to our house bordered the quarry and the Stoneycroft Railway line into the sidings on Cromford Road..Other than for having to clean the windows and sills regularly of lime dust..we lived happily near the works..and of course, it being a local grown industry, it employed local men..although as my Grandfather and others of my kin were killed at Killer Bros Quarry Middleton..my father vowed never to let any of his sons become quarrymen..
Footnote.. Near to Coneygreave Farm is a track called Peat Lane. 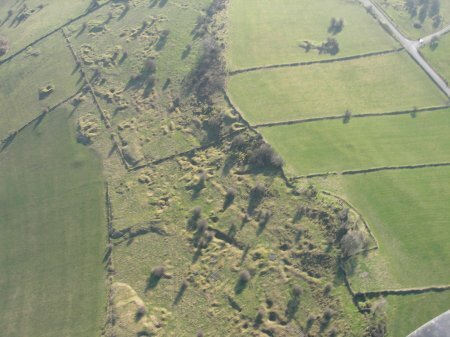 Alport Heights is one of my favourinte places ..It is said that on a clear day the Welsh border can be seen from the Heights.. My Flint and allied family way back in the 1600s lived at The Bent Alport and Ashleyhay/Shottle and Alderwasley .. In June 2005 Neil France, a private pilot from Matlock, accompanied a friend who is also a pilot on a local flight from Derby Airfield in an aircraft type Mr France had not previously flown in. Not long after take off, the pilot became medically incapacitated with his leg locked on the controls and the aircraft entered a steep spiral dive. Mr France managed to take control to regain level flight and, after exchanging headsets with the unconscious pilot, made contact with Derby Radio for advice regarding approach and landing speeds. Mr France restrained the pilot, who regained consciousness just at the point of flare, and safely brought the aircraft to rest on the runway at Derby Airfield.